IELTS Reading – Guess work? Anybody out there who has completed an IELTS reading knows that guessing is sometimes unavoidable. It is true that it is better to write something than nothing, but is there such a thing as an educated guess? I have a suggestion. Let’s look at True / False / Not Given, or Yes / No / Not Given questions. Now, let’s imagine that you have scanned the text, gone through the questions, found the place where the answer is likely to be, and you still can’t find it. 1) If you randomly guess every answer, there is a possibility you will be wrong every time. 2) If you guess the same answer each time, there is a much better chance you will get a minimum of 1 answer correct, as IELTS exams vary the answers between the three options. I have never seen a task in IELTS that doesn’t include at least one answer from each option. 3) Why Not Given? Well, two reasons. Firstly, if you are looking for an answer and you can’t find it, maybe it’s because the answer isn’t there! I think you should trust your ability and have a confident mind. Tell yourself that you didn’t find it because it is Not Given, write it and move on, confidently. Secondly, Not Given answers are a task that is specifically an “IELTS task”. Therefore, the exam papers will always contain at least one answer per task that is “Not Given”. I think you give yourself a chance of free points this way. Choose Not Given! Be confident! IELTS Reading (mini-tip) – what order do you answer questions in? Let’s think about tasks such as True / False / Not Given, sentence completion and short answer questions. You will find that the answers can be found in the text in order. But are you using this fact to your maximum advantage? Have a look at this short example text below. Chilies originate in South America and have been eaten for at least 9,500 years. Organised cultivation began around 5,400BC. Christopher Columbus was the first European to encounter chilies, when he landed on the island of Hispaniola in 1492. He thought it was a type of pepper and called it the “red pepper”, a name still used today. After their introduction to Europe they were an immediate sensation and were quickly incorporated into the diet. From there they spread to Africa, India and East Asia. The reason for the chilli’s “hotness” lies in a chemical called Capsaisin. Capsaisin causes temporary irritation to the trigeminal cells, which are the pain receptors in the mouth, nose and throat. After the pain messages are transmitted to the brain, endorphins, natural pain killers, are released and these not only kill the pain but give the chili eater a short lived natural high. Other side effects include: an increased heart rate, a running nose and increased salivation and sweating, which can have a cooling effect in hot climates. People have started to breed and grow chillies specifically to find hotter and hotter varieties, and what was once a pastime or the labour of practical joke production, has now become a competition worth a lot of money, particularly in the States. Not only is production big business, but the ability to consume and digest these spicy monsters has also become a gateway to fame and (small) fortune, with eating competitions on the rise year on year. While there is no direct link between eating these mutant chillies and ill-effects, there have been instances of hospitalisation on several occasions in the last few years, with this figure also on the rise. 1. Chilies became popular as soon as they were brought into Europe. 2. Capsaisin damages the mouth. 3. Chilies can be part of a birds diet. 4. Smaller chillies are generally hotter than larger chillies. But what next? In a longer text, I find that sometimes students perform better when the next question they answer is question 5, not question 2. Pretty simple, really. Sometimes, the final answer can be found a long way before the end of the text. (In this case, you can find the answer in line 1 of the second-to-last paragraph – “The smaller chillies tend to be the hottest”) If you can find the final answer position, you can then trap the remaining answers in between questions 1 and 5, so that you reduce the area of text that you have to scan. See below: Blue – question 1 answer / question 5 answer. BOLD = text containing answers 2-4. Have a try of this next time, and remember: IELTS is about finding a technique that you are comfortable with. There is not one “correct” way – if this tip works for you, that’s great. If it doesn’t, don’t worry. There will be another way that you are happy with. Here is a step by step guide for completing this kind of task. Remember to practise these steps until you have memorised them! Take a look at the task below. from colorblindness. On average 10 ………………..
have two 11 ……………….. For this reason it is 12……………….. for a woman to suffer from colorblindness. Often, the first thing you think is “what shall I read first?” In this case, the first thing to do is think about your grammar knowledge – just like you do in the listening exam during your preparation time. What kind of words do I need? What are the most logical answers? Does this knowledge help you? Now look at the text here http://www.ielts-exam.net/ielts_reading/119/#P6b What you want to do is pick a keyword from the first sentence of the question, and match that to something in the text. Look at the beginning of paragraph B and you can see “men” and “colorblindness”. Now all you need to do is match a word or a synonym to one of the possible answers (you can see the word “myth” very early on – the answer to question 9). Now complete the other three questions. So, in this task you don’t need to understand very much at all – you are just matching a few words and synonyms! Good news! Here is a step by step guide to answering these questions. I think that heading matching is the easiest task, so I always advise you do it first if you see it in the exam! 2) With a heading matching exercise, the first thing to do is read the first two sentences of each paragraph and try to match any keywords / synonyms to the questions. Do this for each paragraph. 3) At the end, if there are any you still can’t match, then go back and read two more sentences. 4) Be quick! If you can match two keywords or an idea, you don’t need to read any more, so don’t! Remember, if you’ve read four sentences and you still don’t know the answer, don’t waste your time – go to the next question and leave this one. area, not counting Antarctica, and the proportion is rising. drive up the price of land. cent in the average levels of farm subsidies paid by the rich countries in 1986-1990. Good luck – remember to give yourself one minute per question, and don’t overread – match ideas, be confident and move on to the next question! If you’ve read my other entry about reading (What to expect and Time Management), then you might want to do some practice reading. Here are some links to a few different kinds of question. Also, at the bottom of the page, you will find some documents you can download. 1 hour, 3 texts, 40 questions. IELTS reading is not easy! Being prepared for all possible question types and having a clear strategy for each of them is important. On this page you can find examples of all the question types and a few tips on how to do these kinds of tasks. At the bottom of the page, there are a few general tips on time management to remember when doing the test. Let’s have a look below at examples of these. This is where you will have a general question and you will need to write the answer with a word limit. Example: What kind of flower bears the most fruit in Autumn? Find a key word in the question. Here, “Autumn” or “Fruit” are good examples. Now, start from the beginning of the text. These questions will be in order in the text. So if you find an answer, the next answer will come after this one. The answer will not exactly match the question, but will use synonyms or paraphrase. Here, you are expected to scan for specific details. Read the questions first, then scan. You do not need to read the text first – this is a waste of time. Similar to short answer questions, you have a word limit but this time you complete the sentences instead of asking questions. Use NO MORE THAN TWO WORDS from the text for this answer. Example: The roots of the plan then point towards the _______________ . This is a similar kind of question to short answer questions – scanning for information and synonyms. The difference here though, is that you are asked to find words that are in the text. Name Size Area Found Endangered? The All Blacks were expected to win the 1991 championship __________. However, they encountered great ____________ before the tournament, when a number of the team suffered ______________. Ultimately they were ­­­­­­­­­­­­­_______________ of making the final, their tournament ending in ______________________. Sometimes, you will see this summary with no words to help you. With these five types of question, the important thing is to find the correct area of the text. This means you need to skim. Remember, when you find the correct paragraph, answers inside the paragraph might not be in order. If you get a summary with words question, it is often quite easy because there might be only one possible word that fits in the space. You may not even need to read the text! Can you do the exercise above? Match each item with its inventor. Write the letter A-E in boxes 7-10 on your answer sheet. You may use any letter more than once. For this kind of question, you need to scan, not read. Names are easy to search for, because they always contain capital letters. Find all the names and circle them, then go back and read the two sentences around each name to find the answers. OK, so you get some questions and have to write Yes, No, Not Given, True or False. CHECK THE QUESTION. Don’t write “True” if it asks you to write “Yes” and don’t write “Y” either. Do exactly as the question asks you so that you aren’t worried after the test. Also, you have to forget any knowledge you have of the subject from outside the exam. Only look at the text. Finally, be happy: these questions are in order in the text! What is the difference between No / False and Not Given? NO / FALSE means that there is information in the text that disagrees with the question. NOT GIVEN means you can’t find any information. Trust yourself: scan the text for the area you think the answer is from, and if you can’t find any information, write NOT GIVEN. Like with matching information or opinion, you will be given some sentences that are incomplete, which you must match to sentence endings, or you will be given a list of paragraph titles which you will need to match with paragraph titles. There may be more titles than answers, so you don’t need to use all the choices. 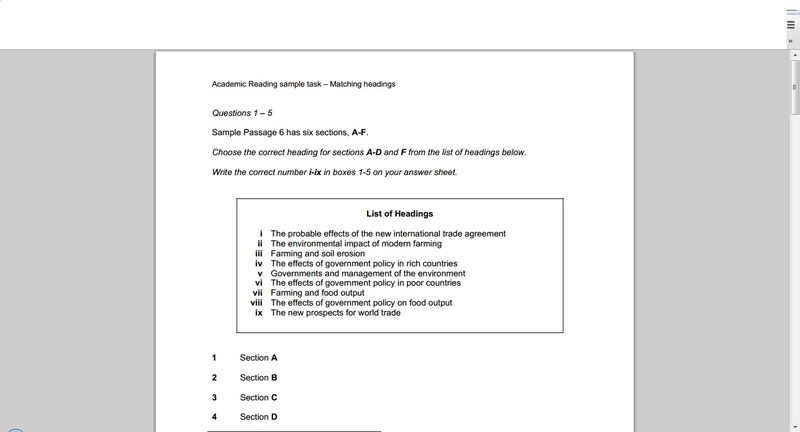 This passage has 5 sections, A to E.
Choose the correct heading for sections B to E from the list of headings below. List of Headingsi The effect of globalisation on Eastern Europeii What is Globalisation? Paragraph matching is possibly the fastest section you can get. The sentences that have the same information as the titles are always found at the beginning of the paragraphs, so that’s all you need to read! The paragraphs are clearly marked, so you don’t have to spend time looking through large amounts of text to find your answers. Remember here you can only use each title once! With these questions, you will be asked to choose one or two letters that answer the question correctly. Check the question carefully. Choose the appropriate letter A-D and write them in boxes 1-3 on your answer sheet. These questions are in order, which is always good! Find a key word in the answers and scan the text for it. For example, if I want to check C, I will look for a word that means poisonous. Is it mentioned with reference to foxgloves? Take a watch. Instead of trying to time every question, time a section. You have 18 minutes for each section. Don’t go over! You need five minutes at the end to guess all the answers that you haven’t found. Don’t leave anything blank – you don’t get anything for nothing! Practise the test before going in. This may sound obvious, but practising will help you learn which kinds of questions you find easier. I personally think that matching paragraphs to headings is the easiest task, so I would do it first. You don’t need to do the test in order. Choose the easiest question types first, or the types of question where guessing at the end is impossible. For example, sentence completion, summary completion with no words. Read the questions first and decide if you are skimming or scanning, and if the answers are in order or not. Then you know how much you have to read. Don’t read the whole text first – you might not need to and it would be a waste of time. Write your answers directly on the answer sheet. Unlike listening, there is no extra time at the end to transfer your answers. Practise speed reading outside the classroom. Take a newspaper and read one page. Time yourself. Now do another, but set a time that’s 30 seconds faster. In your language you don’t look at every word individually – you just look at three together, or the ‘meaning’ words, skimming the grammar. Try and make yourself do this by not reading with your finger. Trust yourself. When you have written an answer, move on. It’s difficult, but you have to do it. Don’t get interested in the text. Don’t think about the text – think about the questions and try to be as much like a robot as you can! So don’t read the text first. You risk becoming interested and reading more slowly! Above all, good luck. I hope these tips help you with the reading test. Remember, to get 4.5 you don’t even need to answer half the questions correctly, so be positive and practise, practise, practise!